Students at a Buchanan school are becoming part of a national movement. 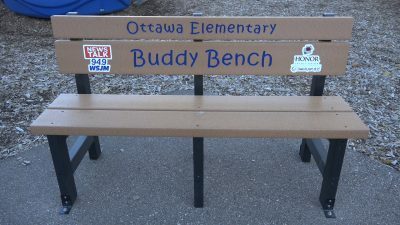 Ottawa Elementary School was one of two Southwest Michigan elementary schools to receive a Buddy Bench at the beginning of the school year. The bench was officially presented Tuesday morning. Last school year, students wrote letters stating why they felt their school deserved to receive a bench. “I feel we need a Buddy Bench, because a Buddy Bench would help us make friends,” Maya Benjamin, a first-grader at Ottawa, said reading her letter to the school.